The invention discloses a hydroxyl-contained N-acylamino acid and a preparation method thereof. The hydroxyl-contained N-acylamino acid has the structure as follows: the hydroxyl-contained N-acylamino acid disclosed by the invention can be used for the field of material synthesis, medicines and the like, and is an intermediate product for synthetizing a high molecular material. The synthetized high molecular material is prepared into a scaffold soaked in a phosphate buffer solution; in nine months, compared with a caprolactone homopolymer, the weight is not reduced basically, whereas the weight of a caprolactone blending polymer of the hydroxyl-contained N-acylamino acid is reduced by about 8 percent; and in 10 weeks, the weight of a dioxanone homopolymer is reduced by 26 percent, whereas the weight of a dioxanone blending polymer of the hydroxyl-contained N-acylamino acid is reduced by 35 percent. Compared with the corresponding homopolymers in the prior art, the degradation rate of the blending polymers synthetized by the intermediate products is greatly increased. 本发明属于精细有机合成领域，涉及一类含有旋光活性或者消旋的含羟基的N-酰代氨基酸及制备方法。  The present invention belongs to the field of fine organic synthesis, it involves substituting N- acyl amino acids and hydroxyl group-containing preparation of a class of optically active or racemic. 构成人体的氨基酸有20多种，它们是：色氨酸、蛋氨酸、苏氨酸、缬氨酸、赖氨酸、 组氨酸、亮氨酸、异亮氨酸、丙氨酸、苯丙氨酸、胱氨酸、半胱氨酸、精氨酸、甘氨酸、丝氨酸、 酪氨酸、3，5_ 二碘酪氨酸、谷氨酸、天门冬氨酸及瓜氨酸等。  There are 20 kinds of amino acids constituting the human body, they are: tryptophan, methionine, threonine, valine, lysine, histidine, leucine, isoleucine, alanine, phenylalanine, cystine, cysteine, arginine, glycine, serine, tyrosine, 3,5_ diiodotyrosine, glutamic acid, aspartic acid and citrulline and the like. 这些氨基酸存在于自然界中， 在植物体内都能合成，而人体不能全部合成。 These amino acids exist in nature, can be synthesized in plants, the human body can not synthesize all. 其中8种是人体不能合成的，必需由食物中提供，叫做“必需氨基酸”。 Which are eight kinds of human body can not synthesize, and must be provided by the food, called "essential amino acids." 这8种必需氨基酸是：色氨酸、苏氨酸、蛋氨酸、缬氨酸、赖氨酸、亮氨酸、异亮氨酸和苯丙氨酸。 These eight essential amino acids: tryptophan, threonine, methionine, valine, lysine, leucine, isoleucine and phenylalanine. 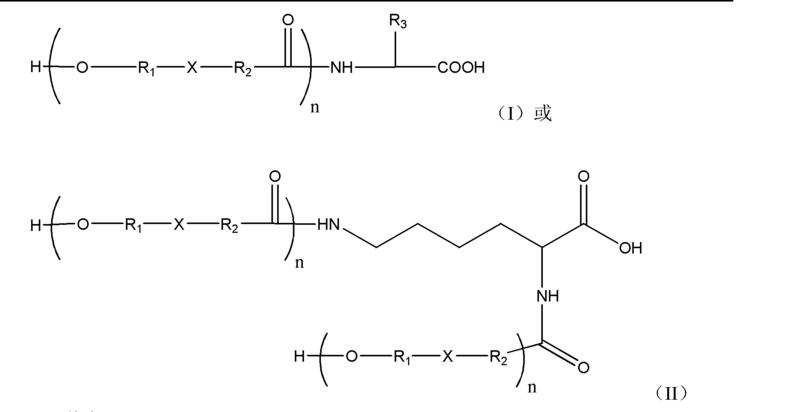 其他则是“非必需氨基酸”。 The others are "non-essential amino acids." 组氨酸能在人体内合成，但其合成速度不能满足身体需要，有人也把它列为“必需氨基酸”。 Histidine can be synthesized in the human body, but its rate of synthesis can not meet the body's needs, it was also classified as "essential amino acids." 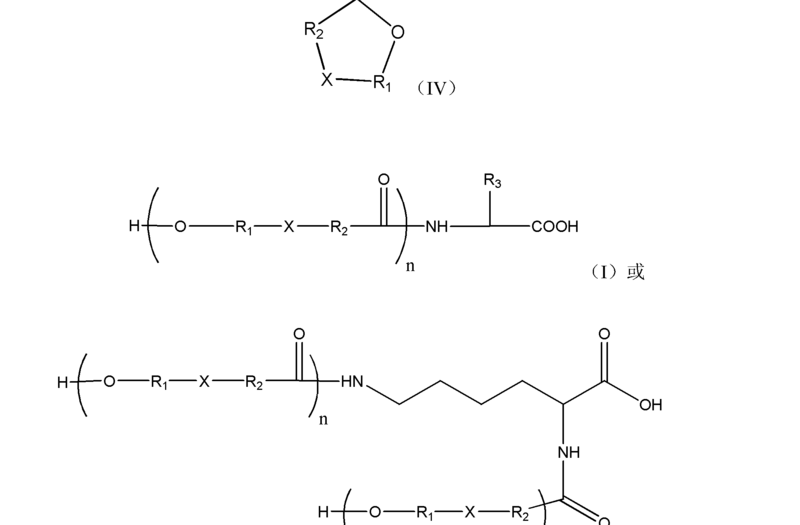 除甘氨酸外，上述蛋白质中的氨基酸均属L-α-氨基酸。 Addition of glycine, the above protein amino acid L-α- acids belong. L-α-氨基酸广泛地用于医药卫生以及医用高分子材料的合成之中，例如利用L-α -氨基酸合成的聚氨基酸和聚酯聚酰胺材料已经被证实可以用作医用高分子材料。  L-α- amino acid widely used in the pharmaceutical and medical hygiene synthetic polymer material, for example, using L-α - amino acids and synthetic polyamino acid polyester polyamide materials have been shown to be used as medical polymer material. 他们在人体内，可以发生降解成为小分子L- α -氨基酸，被人体吸收利用，因此由L- α -氨基酸制备的医用高分子材料具有极其重要的意义。 In the human body they can be degraded into small molecules L- α - amino acids, absorbed by the body, so the L- α - extremely important medical polymer materials prepared from amino acids. 文献报道，基于L-α-氨基酸通过一系列复杂的化学反应，合成出吗啉_2，5- 二酮衍生物，再通过开环聚合反应得到聚吗啉_2，5- 二酮衍生物类医用高分子材料。 It reported that, based on the amino acid L-α- through a series of complex chemical reactions, the synthesized _2,5- morpholine dione derivative, and then by ring-opening polymerization to obtain poly morpholine dione derivative _2,5- based medical polymer materials. 这类可降解的高分子材料可以用于药物控制释放、形状记忆高分子材料、组织工程支架等等。 Such degradable polymers may be used to control the release of the drug, shape memory polymer materials, tissue engineering scaffolds and the like. L-α-氨基酸分子中含有氨基和羧基，有的还有侧链功能基团例如羟基、羧基、氨基、巯基等，功能基团一般需要经过保护、活化后，才能进行所需要的化学反应，避免其他功能基团参与反应。 L-α- amino acid molecule comprising the amino and carboxyl groups, and some have side-chain functional groups such as hydroxy, carboxy, amino, mercapto and the like, functional groups generally require protection, after activation, in order to carry out the desired chemical reaction, avoid other functional groups involved in the reaction. 这就导致合成反应路线过长，产率低，而且有的反应必须在高温下，还会造成氨基酸消旋反应的发生。 This results in a long synthesis scheme, the yield is low, and in some cases the reaction must be at a high temperature, it will result in racemization of amino acids occurs. 含有旋光活性或者消旋的氨基酸结构的醇化合物是一类重要的精细化工原料，他们在医药、材料合成领域有重要应用。  The alcohol compound containing an optically active amino acid structure or is a racemic important class of chemical raw materials, they have important applications in medicine, materials synthesis. 传统方法利用L- α -氨基酸合成含有旋光活性或者消旋的氨基酸结构的醇，必须经过对不参加反应的基团的保护、参与反应基团的活化、合成、脱保护等化学反应步骤，这必造成产率低，有时还会发生消旋化反应。 Conventional method using L- α - amino alcohols containing synthetic amino acid structure of the optically active or racemic, for protective group must not participate in the reaction, to participate activation, synthesis of reactive groups, the deprotection step chemical reaction which will resulting in low yields, racemization may also occur. 本发明的目的是克服现有技术存在的不足，提供含羟基的N-酰代氨基酸。  The object of the present invention is to overcome the shortcomings of the prior art, to provide N- Acyl hydroxyl-containing amino acids. 本发明的第二个目的是提供含羟基的N-酰代氨基酸的制备方法。  A second object of the present invention is to provide N- Acyl hydroxyl-containing amino acid preparation. 保护基团为羰基苄氧基、叔丁氧羰基、苄醇基、金刚烷醇基、环烷醇基、苄基、叔丁基、2-苄氧草酰基、丁二酰基、对甲苄基、三苯甲基或对硝基苄基。  The protective group is a benzyloxy carbonyl group, t-butoxycarbonyl group, a benzyl alcohol, adamantanol group, cycloalkanols, benzyl, t-butyl, 2-benzyloxy oxalyl, succinyl, for methylbenzyl, trityl or p-nitrobenzyl. 优选的含羟基的N-酰代氨基酸的制备方法，步骤为：将氨基酸盐或带保护基团的氨基酸盐（III)和环内酯（IV)在温度为0°C-19(TC反应30分钟-7天，得到含羟基的N-酰代氨基酸盐，加酸酸化，得到含羟基的N-酰代氨基酸（I)或（II)。  Preparation of N- Acyl preferably hydroxyl-containing amino acid, the steps of: amino acid salt (III) salt or a protected amino group and a lactone (IV) at a temperature of 0 ° C-19 ( TC 30 minutes to 7 days, to obtain a hydroxyl group-containing acid salt of N- acyl, plus sprig give N- acyl amino acid (I) or (II) containing a hydroxyl group. 反应温度较好的是50°C _140°C，反应时间为4小时_2天。  The reaction temperature is preferably 50 ° C _140 ° C, the reaction time was 4 hours _2 days. 所述氨基酸盐中的氨基酸为L-氨基酸、D-氨基酸或D，L-氨基酸。  The amino acid salt of L- amino acids, D- amino acids or D, L- amino acids. 所述氨基酸为甘氨酸、色氨酸、蛋氨酸、苏氨酸、缬氨酸、赖氨酸、组氨酸、亮氨酸、 异亮氨酸、丙氨酸、苯丙氨酸、胱氨酸、半胱氨酸、精氨酸、丝氨酸、酪氨酸、谷氨酸、天门冬氨酸或瓜氨酸。  The amino acid is glycine, tryptophan, methionine, threonine, valine, lysine, histidine, leucine, isoleucine, alanine, phenylalanine, cysteic acid, cysteine, arginine, serine, tyrosine, glutamic acid, aspartic acid or citrulline. 所述带保护基团的氨基酸盐为N( ε )-羰基苄氧基-L-赖氨酸盐、Ν( ε )-羰基苄氧基-D-赖氨酸盐、Ν(ε)-羰基苄氧基-D，L-赖氨酸盐、Ν(ε)-叔丁氧羰基-L-赖氨酸盐、N ( ε )-叔丁氧羰基-D-赖氨酸盐、N ( ε )-叔丁氧羰基_D，L-赖氨酸盐、L-天门冬氨酸盐-β -苄酯、D-天门冬氨酸盐-β -苄酯、D，L-天门冬氨酸盐-β -苄酯、L-天门冬氨酸盐-β-金刚烷酯、D-天门冬氨酸盐-β-金刚烷酯、D，L-天门冬氨酸盐-β-金刚烷酯、 L-天门冬氨酸盐-β -环烷酯、D-天门冬氨酸盐-β -环烷酯、D，L-天门冬氨酸盐-β -环烷酯、L-谷氨酸盐-Υ -苄酯、D-谷氨酸盐-Υ -苄酯、D，L-谷氨酸盐-Υ -苄酯、L-谷氨酸盐-Y -金刚烷酯、D-谷氨酸盐-Y -金刚烷酯、D，L-谷氨酸盐-Y -金刚烷酯、L-谷氨酸盐-Y -环烷酯、D-谷氨酸盐-Y -环烷酯、D，L-谷氨酸盐-Y -环烷酯、0-苄基-L-丝氨酸盐、0-苄基-D-丝氨酸盐、0-苄基-D，L-丝  The salts with amino protecting group is N (ε) - benzyloxy carbonyl group -L- lysine, Ν (ε) - benzyloxy carbonyl group -D- lysine, Ν (ε ) - benzyloxy carbonyl group -D, L- lysine, Ν (ε) - -L- tert-butoxycarbonyl-lysine, N (ε) - -D- tert-butoxycarbonyl-lysine, N (ε) - tert-butoxycarbonyl group _D, L- lysine, L- aspartate -β - benzyl ester, D- aspartate -β - benzyl ester, D, L- tianmen aspartic acid salt -β - benzyl ester, L- aspartate -β- adamantyl, D- aspartate -β- adamantyl, D, L- aspartate -β- adamantyl, L- aspartate -β - cycloalkyl esters, D- aspartate -β - cycloalkyl ester, D, L- aspartate -β - cycloalkyl ester, L- glutamate -Υ - benzyl ester, D- glutamate -Υ - benzyl ester, D, L- glutamate -Υ - benzyl ester, L- glutamate -Y - adamantyl, D - glutamate -Y - adamantyl, D, L- glutamate -Y - adamantyl, L- glutamate -Y - cycloalkyl esters, D- glutamate -Y - ring alkyl ester, D, L- glutamate -Y - cycloalkyl ester, salt of O-benzylhydroxylamine -L- serine, O-benzyl serine -D- salt, O-benzylhydroxylamine -D, L- wire 酸盐、0-叔丁基-L-丝氨酸盐、0-叔丁基-D-丝氨酸盐、0-叔丁基-D，L-丝氨酸盐、0- (2-苄氧草酰基)-L-丝氨酸盐、0- (2-苄氧草酰基）-D-丝氨酸盐、0-(2-苄氧草酰基）_D，L-丝氨酸盐、0- 丁二酰基-L-丝氨酸盐、0- 丁二酰基-D-丝氨酸盐、0- 丁二酰基-D，L-丝氨酸盐、0-苄基-L-酪氨酸盐、0-苄基-D-酪氨酸盐、0-苄基-D，L-酪氨酸盐、0-叔丁基-L-酪氨酸盐、0-叔丁基-D-酪氨酸盐、0-叔丁基-D，L-酪氨酸盐、0-苄基-L-苏氨酸盐、0-苄基-D-苏氨酸盐、0-苄基-D， L-苏氨酸盐、0-叔丁基-L-苏氨酸盐、0-叔丁基-D-苏氨酸盐、0-叔丁基-D，L-苏氨酸盐、S-苄基-L-半胱氨酸盐、S-苄基-D-半胱氨酸盐、S-苄基-D，L-半胱氨酸盐、S-对甲苄基-L-半胱氨酸盐、S-对甲苄基-D-半胱氨酸盐、S-对甲苄基-D，L-半胱氨酸盐、S-对甲氧苄基-L-半胱氨酸盐、S-对甲氧苄基-D-半胱氨酸盐、S-对甲氧苄基-D，L-半胱氨酸盐、S- Acid, t-butyl 0- -L- serine salt, serine salt -D- tert-butyl-0-, 0- t-butyl -D, L- serine salt, O- (2-benzyloxy oxalyl) -L - serine salt, O- (2-benzyloxy oxalyl) -D- salt-serine, O- (2-benzyloxy oxalyl) _D, L- serine salt, serine salt 0- succinyl -L-, 0- succinyl- -D- serine salts, 0- succinyl -D, L- serine salts, salts of O-benzylhydroxylamine -L- tyrosine, O-benzyl-tyrosine -D- salt, O-benzylhydroxylamine -D, L- tyrosine salts, O-tert-butyl salts -L- tyrosine, O-tert-butyl salts -D- tyrosine, O-tert-butyl -D, L- tyrosine salt , O-benzyl-threonine salt -L-, O-benzyl-threonine -D- salt, O-benzylhydroxylamine -D, L- threonine salt, t-butyl 0- -L- threonine salts, O-t-butyl threonine -D- salts, O-tert-butyl -D, L- threonine salt, S- benzyl -L- cysteine ​​salts, S- benzyl -D- salts of cysteine, S- benzyl -D, L- cysteine ​​salt, S- methylbenzyl -L- cysteine ​​of salt, S- methylbenzyl for cysteine ​​salts -D- , S- methylbenzyl of -D, L- cysteine ​​salt, S- p-methoxybenzyl salt -L- cysteine, S- p-methoxybenzyl group -D- cysteine ​​salts, S- p-methoxybenzyl group -D, L- cysteine ​​salt, S- 丁基-L-半胱氨酸盐、S-叔丁基-D-半胱氨酸盐、S-叔丁基-D，L-半胱氨酸盐、 S-三苯甲基-L-半胱氨酸盐、S-三苯甲基-D-半胱氨酸盐、S-三苯甲基-D，L-半胱氨酸盐、 S-对硝基苄基-L-半胱氨酸盐、S-对硝基苄基-D-半胱氨酸盐或S-对硝基苄基-D，L-半胱氨酸盐。 Salt butyl -L- cysteine, S- t-butyl -D- cysteine ​​salt, S- t-butyl -D, L- cysteine ​​salt, S- trityl -L- salts of cysteine, S- salt trityl -D- cysteine, S- trityl -D, L- cysteine ​​salt, S- nitrobenzyl -L- cysteine ​​pair acid salt, S- p-nitrobenzyl -D- cysteine ​​salt or S- p-nitrobenzyl -D, L- cysteine ​​salts. 环内酯（IV)为£-己内酯、对二氧环己酮、1，3-丙内酯、1，4-丁内酯、1，5-戊内酯、1，7-庚内酯、1，4-庚内酯、Y-辛内酯、δ-辛内酉旨、γ-壬内酯、δ-壬内酯、γ-癸内酯、S-癸内酯、ε-癸内酯、丁位十一内酯、丁位十二内酯、丁位十三内酯、丁位十四内酯、 环十五内酯或环十六内酯。  The lactone (IV) as £ - caprolactone, p-dioxanone, 1,3-propiolactone, butyrolactone, 1,4, 1,5-valerolactone, 1,7 - heptalactone, heptyl 1,4-lactone, Y- oct-lactone, delta-octyl unitary purpose, [gamma] -nonalactone, delta-nonalactone, [gamma] -decalactone, S- -decalactone, ε- decalactone, Ding bit undecalactone, Ding bit Dodecalactone, Ding bit thirteen butyrolactone, G-butyrolactone bit fourteen, fifteen lactone ring or ring hexadecanolide. 本发明所提供的含羟基的N-酰代氨基酸可用于材料合成、医药等领域。  Acyl N- hydroxy-containing amino acids provided by the invention may be used in the field of synthetic materials, medicine and the like. 本发明合成的N-酰代氨基酸一端含有羟基，另一端含有羧基。 The present invention is N- Acyl synthetic amino acid containing a hydroxyl group at one end, the other end containing a carboxyl group. 化合物具有两个官能度，是一类合成高分子材料的中间体。 A compound having two functionalities, synthesis of intermediates is a polymer material. 在催化剂存在条件下，由这些中间体合成了己内酯混聚物和对二氧环己酮混聚物。 In the presence of a catalyst, these intermediates in the synthesis of homopolymers of caprolactone and mixing of mixed dioxanone homopolymer. 将合成的材料做成生物支架浸泡在磷酸缓冲溶液中，在9个月的时间内， 对比己内酯均聚物质量基本上没有减少，而本发明的己内酯混聚物质量减少了约8% ；在10周内，对二氧环己酮均聚物质量较少沈%，而本发明的对二氧环己酮混聚物质量减少了35%。 The materials made of synthetic scaffold was immersed in phosphate buffer solution, in 9 months, caprolactone homopolymer comparison did not substantially reduce the quality, but the present invention is caprolactone homopolymer blended mass is reduced by about 8%; at 10 weeks of dioxanone homopolymer less heavy mass%, while mixed dioxanone dimer of the present invention reduces the mass of 35%. 由这些中间体合成的混聚物与现有技术相应的均聚物相比，降解速率有很大的提高。 These intermediates synthesized from prepolymer mixture prior art compared to the corresponding homopolymer, has a greatly improved rate of degradation. 由这类中间体合成的聚合物材料在生物体内降解为羟基羧酸和氨基酸，氨基酸可以被生物体利用，减少了高分子材料降解产物在体内的积累，减轻或者避免生物材料降解产物在体内引起不良的反应。  The intermediate polymer synthesized from such materials in vivo degradation of amino acids and hydroxycarboxylic acids, amino acids may be utilized organism, reduces the accumulation of polymeric materials in vivo degradation products, reduce or prevent degradation products of biological material cause adverse reactions in the body. 同时，本发明的合成产物含有氨基酸残基，并且保持了氨基酸的旋光性。 Meanwhile, the synthetic product of the present invention contain amino acid residues, and maintains the optically active amino acids. 本发明的含羟基的N-酰代氨基酸的制备方法，产物旋光活性取决于所用原料的旋光活性。  The present invention is a method for preparing N- Acyl hydroxyl-containing amino acids, depending on the product optically active optically active starting materials are used. 采用L-氨基酸盐，则制备出含L-氨基酸结构的醇化合物，没有消旋反应发生。 L- amino acid salt employed, the alcohol compound prepared containing L- configuration amino acids, no racemization occurs. 采用D-氨基酸盐，则制备出含D-氨基酸结构的醇化合物，没有消旋反应发生。 D- amino acid salt employed, the alcohol compound prepared containing D- amino acid structure, there is no racemization occurs. 采用消旋的D，L-氨基酸盐，则制备出含消旋的D，L-氨基酸结构的醇化合物。 Using racemic D, L- amino acid salt is prepared containing racemic D, L- amino alcohol compound structure. 本发明的方法原料易得， 也容易制备。 The method of the present invention is readily available starting material, can be easily prepared. 图1为N-己内酯酰代-L-丙氨酸的1H-NMR谱图。  FIG. 1 is N- caprolactone Acyl -L- alanine 1H-NMR of spectra. 图2为N-聚己内酯酰代-L-亮氨酸的1H-NMR谱图。  FIG. 2 is a polycaprolactone N- Acyl -L- leucine 1H-NMR of spectra. 图3为N-对二氧环己酮酰代-L-亮氨酸的1H-NMR谱图。  FIG. 3 is a p-dioxanone N- Acyl -L- leucine-one 1H-NMR of spectra. 下面结合具体实施例对本发明作进一步的说明。  Specific embodiments of the present invention in conjunction with the following be further described. 将0. Imol的L-丙氨酸钠和0. 4mol的ε -己内酯混合均勻，在60°C反应4小时， 然后在80°C反应2小时，得到白色固体粉末，依次用乙醚和乙酸乙酯洗涤，干燥得到白色晶体，经过盐酸酸化至pH等于2，用乙酸乙酯萃取，干燥，旋蒸溶剂得到无色液体，旋光度为+14.5°，核磁和红外图谱检测为目标产物。  The L- alanine and sodium 0. Imol 0. 4mol of ε - caprolactone mixed, reacted at 60 ° C 4 hours and then for 2 hours at 80 ° C, to give a white solid powder, sequentially washed with diethyl ether and ethyl acetate and dried to give white crystals, after acidified with hydrochloric acid to pH = 2, extracted with ethyl acetate, dried and the solvent rotary evaporated to give a colorless liquid, an optical rotation of + 14.5 °, NMR and IR spectra detected as the target product. 核磁见图1，δ = 6.87(c)是酰胺的特征吸收峰，结合丙氨酸的特征质子峰δ =4. 51(b)，说明了氨基酸的氨基和ε-己内酯发生了反应，生成了酰胺键，即含羟基的N-己内酯酰代-L-丙氨酸。 NMR shown in Figure 1, δ = 6.87 (c) is a characteristic absorption peak of an amide, wherein the alanine bound proton peaks δ = 4. 51 (b), the amino acid is described and ε- caprolactone a reaction occurs, an amide bond is generated, i.e., the hydroxyl group-containing polycaprolactone N- acyl -L- alanine. δ =4.01(i)、S =3. 62(j), δ =2. 14(d)是ε -己内酯链段的特征质子峰，ε -己内酯结构单元和丙氨酸结构单元通过特征质子峰b和特征质子峰d的积分面积求得。 δ = 4.01 (i), S = 3 62 (j), δ = 2 14 (d) is ε -.. characteristic proton peak segment caprolactone, ε - caprolactone structural units and structural units alanine determined by integrating the peak area of ​​protons wherein b and d of the proton peaks characteristic. 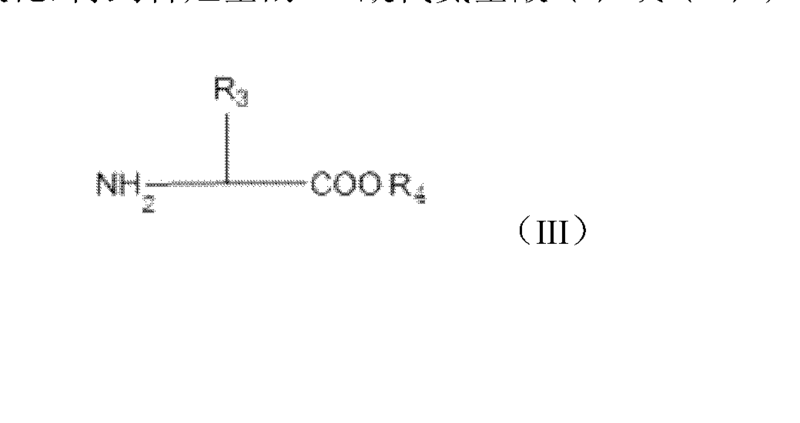 由积分面积得产物分子中含有3个ε-己内酯的结构单元。 To give the integrated area of ​​the structural unit contained in the product molecule 3 ε- caprolactone. 将0. Imol的L-丙氨酸钾和0. Imol的ε -己内酯混合均勻，在140°C下反应30分钟，得到白色固体粉末，依次用乙醚和乙酸乙酯洗涤，干燥得到白色晶体，经过盐酸酸化至PH等于2，用乙酸乙酯萃取，干燥，旋蒸溶剂得到无色液体，核磁谱图中δ =6. 92和红外图谱中3338CHT1为酰胺键的特征质子峰，证实合成的产物为羟基的N-己内酯酰代-L-丙氨酸。  The L- Alanine 0. Imol of potassium and 0. Imol of ε - caprolactone mixed, reacted at 140 ° C 30 minutes to give a white solid, washed with diethyl ether and ethyl acetate, and dried to give white crystals, after hydrochloric acid is equal to PH 2 and extracted with ethyl acetate, dried and the solvent rotary evaporated to give a colorless liquid, NMR proton spectra characteristic peaks δ = 6.92 and infrared spectra of the amide bond in 3338CHT1 It confirmed that the synthesized product is a hydroxyl N- caprolactone acyl -L- alanine. 将0. Imol的D-丙氨酸钠和0. Imol的1，3_丙内酯混合均勻，在50°C反应24小时，得到白色固体粉末，依次用乙醚和乙酸乙酯洗涤，干燥得到白色晶体，经过盐酸酸化至PH等于2，用乙酸乙酯萃取，干燥，旋蒸溶剂得到无色液体，旋光度为-14. 5°。  The 1,3_ propiolactone D- alanine and sodium 0. Imol 0. Imol uniformly mixed, reacted for 24 hours at 50 ° C, to give a white solid powder, washed with diethyl ether and ethyl acetate , and dried to give white crystals, after hydrochloric acid is equal to PH 2 and extracted with ethyl acetate, dried and the solvent rotary evaporated to give a colorless liquid, an optical rotation of -14. 5 °. 核磁图谱中δ = 7. 10是酰胺键的特征质子峰，δ =2.30，δ =3. 81和δ = 3. 96是1，3-丙内酯结构单元的特征峰。 NMR spectra of δ = 7. 10 proton peak is characteristic of an amide bond, δ = 2.30, δ = 3. 81 and δ = 3. 96 is a characteristic peak of structural units of 1,3-propiolactone. 由核磁谱图证实产物为含羟基的N-(l，3-丙内酯）酰代-D-丙氨酸。 The product was confirmed by the NMR spectrum for the hydroxyl group-containing N- (l, 3- propiolactone) Acyl -D- alanine. 实验证明，用D-氨基酸如甘氨酸、色氨酸、蛋氨酸、苏氨酸、缬氨酸、赖氨酸、组氨酸、亮氨酸、异亮氨酸、苯丙氨酸、胱氨酸、半胱氨酸、精氨酸、丝氨酸、酪氨酸、谷氨酸、天门冬氨酸或瓜氨酸替代实施例3的D-丙氨酸钠，其它同实施例3，也可以制备出相应的含羟基的N-己内酯酰代-D-氨基酸。  The experiments show that, with D- amino acids such as glycine, tryptophan, methionine, threonine, valine, lysine, histidine, leucine, isoleucine, phenylalanine, cysteic acid, cysteine, arginine, serine, tyrosine, glutamic acid, aspartic acid citrulline or alternatively sodium D- alanine Example 3, Example 3 with the other embodiments, may be preparation of the corresponding N- hydroxy-containing amino acid -D- acyl caprolactone. 将0. Imol的D，L_丙氨酸铷和0. 4mol的ε -己内酯混合均勻，在0°C下反应7天，然后在80°C反应M小时，得到白色固体粉末，依次用乙醚和乙酸乙酯洗涤，干燥得到白色晶体，产率100%。  A 0. Imol of D, L_ alanine rubidium and 0. 4mol of ε - caprolactone mixed, reacted at 0 ° C 7 days, and then reacted at 80 ° C M h, to give a white solid powder, washed with diethyl ether and ethyl acetate and dried to give white crystals, yield 100%. 经过盐酸酸化至pH等于2，用乙酸乙酯萃取，干燥，旋蒸溶剂得到无色液体，旋光度为0°，核磁和红外图谱，检测为含羟基的N-己内酯酰代-D，L-丙氨酸。 After acidified with hydrochloric acid to pH = 2, extracted with ethyl acetate, dried and the solvent rotary evaporated to give a colorless liquid, rotation of 0 °, NMR and IR spectra, the detection of the hydroxyl group-containing polycaprolactone N- Acyl -D, L- alanine. 实验证明，用D，L-氨基酸如甘氨酸、色氨酸、蛋氨酸、苏氨酸、缬氨酸、赖氨酸、组氨酸、亮氨酸、异亮氨酸、苯丙氨酸、胱氨酸、半胱氨酸、精氨酸、丝氨酸、酪氨酸、谷氨酸、天门冬氨酸或瓜氨酸替代实施例4的D，L-丙氨酸钠，其它同实施例4，也可以制备出相应的含羟基的N-己内酯酰代-D，L—氨基酸。  The experiments show that with the D, L- amino acids such as glycine, tryptophan, methionine, threonine, valine, lysine, histidine, leucine, isoleucine, phenylalanine , cystine, cysteine, arginine, serine, tyrosine, glutamic acid, aspartic acid or D-citrulline alternative embodiment 4, L- alanine sodium embodiments, other embodiments of the same 4, may be prepared the corresponding N- hydroxy-containing caprolactone acyl -D, L- amino acids. 将0. Imol的L-谷氨酸钠和0. 4mol的ε -己内酯混合均勻，在60°C下反应2天， 然后在80°C反应M小时，得到白色固体粉末，依次用乙醚和乙酸乙酯洗涤，干燥得到白色晶体，经过盐酸酸化至PH等于2，用乙酸乙酯萃取，干燥，旋蒸溶剂得到无色液体，核磁和红外图谱，检测为含羟基N-己内酯酰代-L-谷氨酸。  The sodium L- glutamate and 0. Imol 0. 4mol of ε - caprolactone mixed, reacted at 60 ° C 2 days, then M h reaction at 80 ° C, to give a white solid powder, washed with diethyl ether and ethyl acetate and dried to give white crystals, after hydrochloric acid is equal to PH 2 and extracted with ethyl acetate, dried and the solvent rotary evaporated to give a colorless liquid, NMR and IR spectra, detected as a hydroxyl group-containing hexyl N- acyl lactones -L- glutamic acid. 将0. Imol的L-赖氨酸钠和0. 4mol的ε -己内酯混合均勻，在60°C下反应4小时，然后在80°C反应M小时，得到白色固体粉末，依次用乙醚和乙酸乙酯洗涤，干燥得到白色晶体，经过盐酸酸化至PH等于2，用乙酸乙酯萃取，干燥，旋蒸溶剂得到无色液体，核磁和红外图谱，以及对旋光性的测定，检测为含羟基的N-己内酯酰代-L-赖氨酸。  The L- lysine and sodium 0. Imol 0. 4mol of ε - caprolactone mixed, reacted at 60 ° C 4 h, M h and then reacted at 80 ° C, to give a white solid powder, washed with diethyl ether and ethyl acetate and dried to give white crystals, after hydrochloric acid is equal to PH 2 and extracted with ethyl acetate, dried and the solvent rotary evaporated to give a colorless liquid, NMR and IR spectra, and the measurement of the optical rotation, N- detected as a hydroxyl group-containing polycaprolactone acyl -L- lysine. 实验证明，用L-氨基酸如甘氨酸、色氨酸、蛋氨酸、苏氨酸、缬氨酸、组氨酸、异亮氨酸、苯丙氨酸、胱氨酸、半胱氨酸、精氨酸、丝氨酸、酪氨酸、天门冬氨酸或瓜氨酸替代实施例6的L-赖氨酸钠，其它同实施例6，也可以制备出相应的含羟基的N-己内酯酰代-L-氨基酸。  The experiments show that, using L- amino acids such as glycine, tryptophan, methionine, threonine, valine, histidine, isoleucine, phenylalanine, cystine, cysteine, arginine, serine, tyrosine, aspartic acid or lysine instead of L- citrulline sodium Example 6, in Example 6 with the other, it may be prepared the corresponding N- hydroxy-containing caprolactone acyl -L- amino acid. 将0. 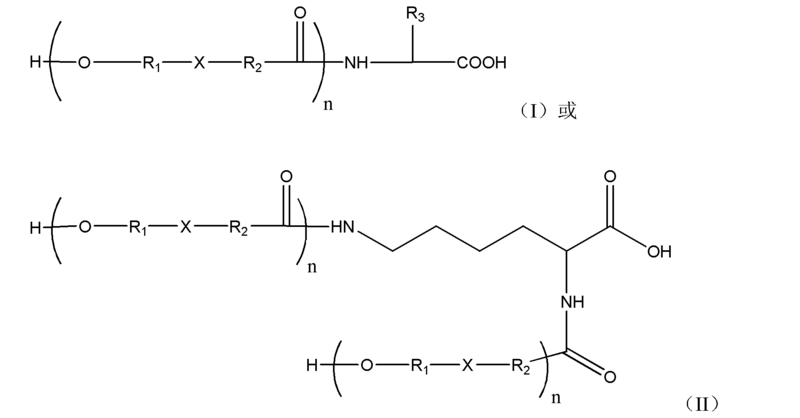 ImolN ( ε )-羰基苄氧基-D-赖氨酸钠和0. Imol的ε -己内酯混合均勻，在120°C下反应6小时，得到白色固体，依次用乙醚和乙酸乙酯洗涤，干燥得到白色固体，经过盐酸酸化至PH等于2，用乙酸乙酯萃取、干燥，旋蒸溶剂得到白色固体，核磁和红外光谱确定产物为N-己内酯酰代-Ν( ε )-羰基苄氧基-D-赖氨酸。  A 0. ImolN (ε) - benzyloxy carbonyl group -D- lysine and sodium 0. Imol of ε - caprolactone mixed, reacted for 6 hours at 120 ° C, to give a white solid, washed with washed with ether and ethyl acetate, and dried to give a white solid, after hydrochloric acid is equal to PH 2 and extracted with ethyl acetate, dried and the solvent rotary evaporated to give a white solid, NMR and IR spectroscopy to determine the product was N- caprolactone acyl - Ν (ε) - benzyloxy carbonyl group -D- lysine. 红外光谱中，3330CHT1为酰胺的伸缩振动峰，3036CHT1为苯环C = CH伸缩振动峰。 Infrared spectrum, 3330CHT1 stretching vibration peak amide, 3036CHT1 a benzene ring C = CH stretching vibration peak. 在核磁谱图中，δ = 8. 62为苯环的特征质子峰，δ = 7. 43为酰胺键的特征质子峰，δ = 4. 07、δ = 3. 70是ε -己内酯链段的特征质子峰。 In the NMR spectrum, δ = 8. 62 features a benzene ring proton peak, δ = 7. 43 wherein an amide bond proton peak, δ = 4. 07, δ = 3. 70 is ε - caprolactone wherein the proton peak. 由核磁和红外光谱图可知Ν( ε )-羰基苄氧基-D-赖氨酸钠的氨基和ε _己内酯发生了反应，合成了N-己内酯酰代_Ν( ε )-羰基苄氧基-D-赖氨酸。 NMR and IR spectra seen from FIG Ν (ε) - benzyloxy carbonyl group -D- lysine [epsilon] _ and sodium amide were reacted caprolactone, caprolactone synthesized N- Acyl _Ν (ε) - benzyloxy carbonyl group -D- lysine. 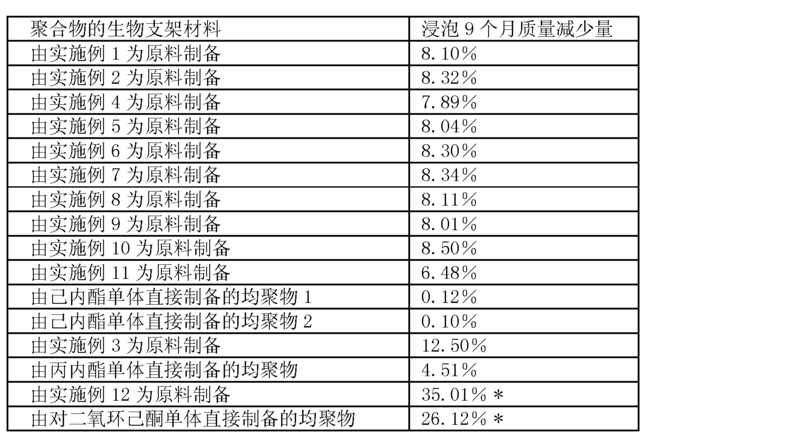 100-苄基-D，L-丝氨酸盐、0-叔丁基-L-丝氨酸盐、0-叔丁基-D-丝氨酸盐、0-叔丁基-D， L-丝氨酸盐、0- (2-苄氧草酰基)-L-丝氨酸盐、0- (2-苄氧草酰基)-D-丝氨酸盐、0- (2-苄氧草酰基)-D, L-丝氨酸盐、0- 丁二酰基-L-丝氨酸盐、0- 丁二酰基-D-丝氨酸盐、0- 丁二酰基-D，L-丝氨酸盐、0-苄基-L-酪氨酸盐、0-苄基-D-酪氨酸盐、0-苄基-D，L-酪氨酸盐、0-叔丁基-L-酪氨酸盐、0-叔丁基-D-酪氨酸盐、0-叔丁基-D，L-酪氨酸盐、0-苄基-L-苏氨酸盐、0-苄基-D-苏氨酸盐、0-苄基-D，L-苏氨酸盐、0-叔丁基-L-苏氨酸盐、 0-叔丁基-D-苏氨酸盐、0-叔丁基-D，L-苏氨酸盐、S-苄基-L-半胱氨酸盐、S-苄基-D-半胱氨酸盐、S-苄基-D，L-半胱氨酸盐、S-对甲苄基-L-半胱氨酸盐、S-对甲苄基-D-半胱氨酸盐、S-对甲苄基-D，L-半胱氨酸盐、S-对甲氧苄基-L-半胱氨酸盐、S-对甲氧苄基-D-半胱氨酸盐、S-对甲氧苄基-D，L-半 100 benzyl -D, L- serine salt, serine salt -L- tert-butyl-0-, 0- -D- tert-butyl-serine salt, O-tert-butyl -D, L- serine salt, O- ( 2- oxalyl benzyloxy) -L- serine salt, O- (2-benzyloxy oxalyl) -D- salt-serine, O- (2-benzyloxy oxalyl) -D, L- serine salt, 0 to D diacyl -L- serine salt, serine salt 0- succinyl -D-, 0- succinyl -D, L-serine salts, salts of O-benzylhydroxylamine -L- tyrosine, O-benzyl -D - salt tyrosine, O-benzylhydroxylamine -D, L- tyrosine salts, O-tert-butyl salts -L- tyrosine, O-tert-butyl -D- tyrosine salts, tert-0- group -D, L- tyrosine salts, O-benzyl-threonine salt -L-, O-benzyl-threonine -D- salt, O-benzylhydroxylamine -D, L- threonine salt, 0 - tert-butyl-salt -L- threonine, O-t-butyl threonine -D- salts, O-tert-butyl -D, L- threonine salt, S- cysteinyl-benzyl -L- acid, S- benzyl -D- cysteine ​​salts, S- benzyl -D, L- cysteine ​​salt, S- methylbenzyl -L- cysteine ​​of salt, S- p- benzyl -D- cysteine ​​salts, S- methylbenzyl of -D, L- cysteine ​​salt, S- p-methoxybenzyl salt -L- cysteine, S- p-methoxybenzyl salt-yl -D- cysteine, S- p-methoxybenzyl -D, L- half 胱氨酸盐、S-叔丁基-L-半胱氨酸盐、S-叔丁基-D-半胱氨酸盐、S-叔丁基-D，L-半胱氨酸盐、S-三苯甲基-L-半胱氨酸盐、S-三苯甲基-D-半胱氨酸盐、S-三苯甲基-D，L-半胱氨酸盐、S-对硝基苄基-L-半胱氨酸盐、S-对硝基苄基-D-半胱氨酸盐或S-对硝基苄基-D，L-半胱氨酸盐。 Cystine salt, S- -L- tert-butyl-cysteine ​​salt, S- t-butyl -D- cysteine ​​salt, S- t-butyl -D, L- cysteine ​​salts, S - trityl salt -L- cysteine, S- salt trityl -D- cysteine, S- trityl -D, L- cysteine ​​salt, S- of nitrate benzyl -L- cysteine ​​salts, S- p-nitrobenzyl -D, L- cysteine ​​salts nitrobenzyl -D- cysteine ​​salt or S-. （上述盐均为钠盐）替代实施例7的N( O-羰基苄氧基-D-赖氨酸钠，其它同实施例7，也可以制备出相应的含羟基的N-酰代氨基酸。 (Such salts are the sodium salt) of Example 7 instead of N (benzyloxy-carbonyl-0- sodium -D- lysine embodiments, other embodiments with 7, may be prepared substituting the corresponding N- hydroxy-containing amino acid. 将0. Imol的甘氨酸锂和0. Imol的ε -己内酯混合均勻，在60°C下反应4小时， 然后在80°C反应2小时，得到白色固体粉末，依次用乙醚和乙酸乙酯洗涤，干燥得到白色晶体，经过盐酸酸化至pH等于2，用乙酸乙酯萃取，干燥，旋蒸溶剂得到无色液体，核磁和红外图谱，检测为含羟基的N-己内酯酰代甘氨酸。  The lithium glycine and 0. Imol 0. Imol of ε - caprolactone mixed, reacted at 60 ° C 4 hours and then for 2 hours at 80 ° C, to give a white solid powder, washed with ether and washed with ethyl acetate, and dried to give white crystals, after acidified with hydrochloric acid to pH = 2, extracted with ethyl acetate, dried and the solvent rotary evaporated to give a colorless liquid, NMR and IR spectra, the detection is N- acyl hydroxyl group-containing polycaprolactone on behalf of glycine. 将0. Imol的L-丙氨酸铯和0. Imol的ε -己内酯混合均勻，并加入400毫升1， 4-二氧六环，在60°C下反应4小时，得到白色固体，依次用乙醚和乙酸乙酯洗涤，干燥得到白色晶体，经过盐酸酸化至PH等于2，用乙酸乙酯萃取，干燥，旋蒸溶剂得到无色液体，核磁和红外图谱，以及对旋光性测定，检测为含羟基的N-己内酯酰代-L-丙氨酸。  The L- Alanine 0. Imol of cesium and 0. Imol of ε - caprolactone mixed, and 400 ml of 1, 4-dioxane, reaction at 60 ° C 4 hours to give as a white solid, washed with diethyl ether and ethyl acetate and dried to give white crystals, after hydrochloric acid is equal to PH 2 and extracted with ethyl acetate, dried and the solvent rotary evaporated to give a colorless liquid, NMR and IR spectra, as well as optically active assay, for the detection of hydroxyl group-containing polycaprolactone N- acyl -L- alanine. 将0. Imol的L-丙氨酸钠和0. 4mol的环十六内酯混合均勻，并加入15毫升无水甲苯，在80°C下反应7小时，得到白色固体，用乙醚洗涤固体，再用蒸馏水将其溶解，然后用盐酸酸化至至PH等于2，用乙酸乙酯萃取，干燥，旋蒸溶剂得到固体。  The sodium L- alanine and ring 0. Imol hexadecanolide 0. 4mol uniformly mixed, and 15 ml of anhydrous toluene was added, reacted at 80 ° C 7 hours to give a white solid with diethyl ether the solid was washed with distilled water and dissolved, and then to a PH equal to 2, acidified with hydrochloric acid and extracted with ethyl acetate, dried and the solvent rotary evaporated to give a solid. 核磁光谱中δ = 7. 13为酰胺键的特征质子峰，证实了环十六酯和L-丙氨酸钠反应生成了N-环十六内酯酰代-L-丙氨酸。 NMR spectrum δ = 7. 13 bond is an amide proton peaks characteristic, it was confirmed cyclic sodium cetyl and L- alanine N- reacting a lactone ring sixteen Acyl -L- alanine. 将0. 0231mol的L-亮氨酸钠和0. 017mol的对二氧环己酮混合均勻，并加入15 毫升无水甲苯，在60°C下反应4小时，得到白色块状固体，然后用氯仿洗涤。  A sodium 0. 0231mol light of L- histidine and 0. 017mol mixed uniformly for dioxanone, and 15 ml of anhydrous toluene was added, reacted at 60 ° C 4 hours to give a white solid block and then washed with chloroform. 将其固体溶于蒸馏水中，经盐酸酸化至pH等于2，再将其蒸馏水旋蒸掉，得到固体，再用丙酮溶解，过滤， 滤液再经过旋蒸干得到目标产物。 The solid which was dissolved in distilled water, acidified with hydrochloric acid to pH = 2, which then distilled off by rotary evaporation to give a solid which was dissolved in acetone, filtered, and the filtrate was evaporated to dryness to give the desired product after a spin. 核磁和红外图谱检测为含羟基的N-对二氧环己酮酰代-L-亮氨酸。 NMR and IR spectra for the detection of hydroxyl-containing N- dioxanone Acyl -L- leucine. 核磁见图3。 NMR shown in Figure 3. δ = 7. 94(e)是酰胺键的特征质子峰，δ = 3. 87(f)是对二氧环己酮结构单元中O = C-NH-的质子峰，δ = 0.87 (a)是L-亮氨酸结构单元中-CH3的特征质子峰。 δ = 7. 94 (e) is an amide bond characteristic proton peak, δ = 3. 87 (f) is a proton peak of dioxanone structural unit of O = C-NH-, δ = 0.87 (a) L- leucine is characteristic structural units of the proton peak -CH3. 比较特征质子峰a和特征质子峰f的强度可知产物分子中含有1个对二氧环己酮结构单元的。 Comparing the intensity peaks characteristic proton and a proton peaks characteristic of the known f product molecule containing one pair dioxanone structural unit. 以实施例1-实施例11制备的含羟基的N-酰代氨基酸为单体，在高真空度条件下，在190°C反应7h，冷却到室温，得到白色固体，将白色固体取出，溶于氯仿中，然后将氯仿溶液逐渐加入乙醚和正己烷的混合溶液（ν ： ν= 1 ： 1)中，得到白色沉淀，再重复沉淀三次，得到沉淀经真空干燥至恒重，为目标聚合物。  In an embodiment of the hydroxyl-containing amino acid N- Acyl Example 11 Preparation of 1- monomer, under high vacuum conditions, 7H reaction at 190 ° C, cooled to room temperature to give a white solid, white solid removed, dissolved in chloroform, and the chloroform solution was gradually added to a mixed solution of diethyl ether and n-hexane (ν: ν = 1: 1) to give a white precipitate, the precipitate was repeated three times, to obtain a precipitate was vacuum dried to a constant weight, is target polymer. 将目标聚合物进行静电纺丝制备成生物支架材料。  The target was prepared as electrostatic spinning of polymer scaffold biomaterials. 将各个生物支架材料和作为对比的相应的均聚物生物支架材料浸泡在磷酸缓冲溶液（pH = 7.4)中，在37°C条件下，浸泡9个月，对比己内酯均聚物质量基本上没有减少， 而本发明的己内酯混聚物质量减少了约8 % ；在10周内，对二氧环己酮均聚物质量减少沈％，对二氧环己酮混聚物质量减少了35%。  Biological Material and respective corresponding comparison homopolymer biological scaffold material immersed in a phosphate buffer solution (pH = 7.4), the condition at 37 ° C for soaking nine months Comparative caprolactone homo- quality was not substantially reduced, while the present invention is caprolactone homopolymer blended mass reduced by about 8%; at 10 weeks of dioxanone homopolymer sink mass reduction% of dioxanone mixed prepolymer mass reduced by 35%. 由这些中间体合成的混聚物与现有技术相应的均聚物相比，降解速率有很大的提高，见表1。 These intermediates synthesized from prepolymer mixture prior art compared to the corresponding homopolymer, has greatly improved the rate of degradation, are shown in Table 1. *为浸泡时间为10周的质量减少量。  * for the soaking time to reduce the amount of mass 10 weeks. 其中：R1为C1-C13的亚脂肪烃基或C7-C16的亚芳香烃基； R2为C1-C13的亚脂肪烃基或C7-C16的亚芳香烃基； R3为氢、氨基酸侧链基团或带保护基团的氨基酸侧链基团； X为氧或亚甲基； η :1-100。 Wherein: R1 is an alkylene C1-C13 aliphatic hydrocarbon group or aromatic C7-C16 alkylene group; R2 is alkylene C1-C13 aliphatic hydrocarbon group or aromatic C7-C16 alkylene group; R3 is hydrogen, amino acid side groups, or a protected amino acid side chain group group; X is oxygen or methylene; η: 1-100. 2.根据权利要求1所述的含羟基的N-酰代氨基酸，其特征是所述氨基酸侧链基团为甘氨酸、色氨酸、蛋氨酸、苏氨酸、缬氨酸、赖氨酸、组氨酸、亮氨酸、异亮氨酸、丙氨酸、苯丙氨酸、胱氨酸、半胱氨酸、精氨酸、丝氨酸、酪氨酸、谷氨酸、天门冬氨酸或瓜氨酸的侧链基团； 所述保护基团为羰基苄氧基、叔丁氧羰基、苄醇基、金刚烷醇基、环烷醇基、苄基、叔丁基、 2-苄氧草酰基、丁二酰基、对甲苄基、三苯甲基或对硝基苄基。 2. 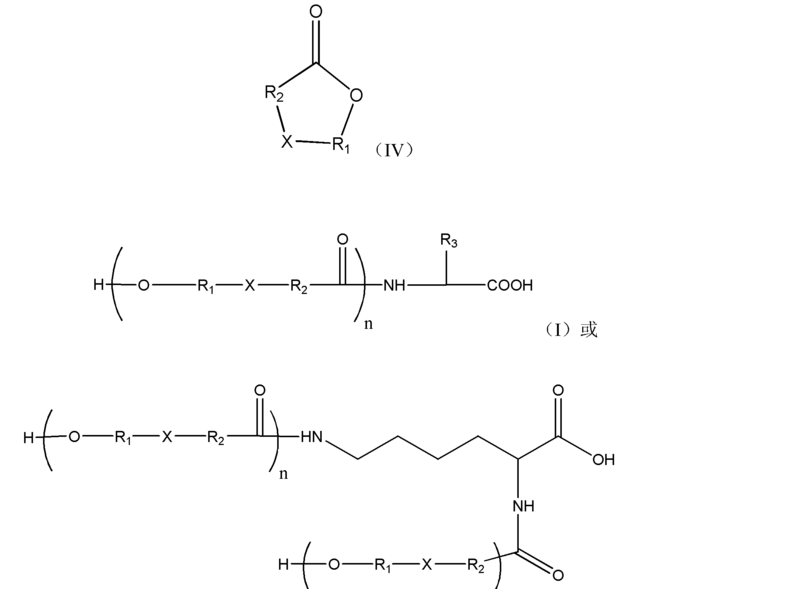 The hydroxy-containing amino acids of the N- Acyl according to claim 1, wherein said amino acid side chain group is glycine, tryptophan, methionine, threonine, valine, lysine, group , leucine, isoleucine, alanine, phenylalanine, cystine, cysteine, arginine, serine, tyrosine, glutamic acid, aspartic acid or melon acid side chain groups; the protecting group is a benzyloxy carbonyl group, t-butoxycarbonyl group, a benzyl alcohol, adamantanol group, cycloalkanols, benzyl, t-butyl, 2-benzyloxy grass acyl, succinyl, p-benzyl, trityl or p-nitrobenzyl. 其中：R1为C1-C13的亚脂肪烃基或C7-C16的亚芳香烃基； R2为C1-C13的亚脂肪烃基或C7-C16的亚芳香烃基； R3为氢、氨基酸侧链基团或带保护基团的氨基酸侧链基团； R4为锂离子、钠离子、钾离子、铷离子或铯离子； X为氧或亚甲基； η :1-100。 Wherein: R1 is an alkylene C1-C13 aliphatic hydrocarbon group or aromatic C7-C16 alkylene group; R2 is alkylene C1-C13 aliphatic hydrocarbon group or aromatic C7-C16 alkylene group; R3 is hydrogen, amino acid side groups, or a protected amino acid side chain group group; R4 is a lithium ion, sodium ion, potassium ion, rubidium ion or cesium ion; X is oxygen or methylene; η: 1-100. 4.根据权利要求3所述含羟基的N-酰代氨基酸的制备方法，其特征是所述步骤为：将氨基酸盐或带保护基团的氨基酸盐（III)和环内酯（IV)在温度为0°C-190°C反应30分钟-7天，得到含羟基的N-酰代氨基酸盐，加酸酸化，得到含羟基的N-酰代氨基酸（I)或(II)。 4. The method for preparing the hydroxyl group-containing 3 N- Acyl-amino acid according to claim, wherein said steps of: amino acid salt (III) acid or a salt thereof with a protective group and lactone rings (IV) in temperature of 0 ° C-190 ° C for 30 minutes to 7 days, to obtain a hydroxyl group-containing acid salt of N- acyl, plus sprig give N- acyl amino acid (I) or (II) containing a hydroxyl group. 5.根据权利要求4所述含羟基的N-酰代氨基酸的制备方法，其特征是所述反应温度为500C _140°C，所述反应时间为4小时-2天。 The method of preparing the hydroxy-containing 4 N- Acyl-amino acid according to claim, characterized in that the reaction temperature is 500C _140 ° C, the reaction time was 4 hours to 2 days. 6.根据权利要求3、4或5所述含羟基的N-酰代氨基酸的制备方法，其特征是所述氨基酸盐中的氨基酸为L-氨基酸、D-氨基酸或D，L-氨基酸。 3, 4, 5 or 6. A method for preparing the N- Acyl hydroxyl-containing amino acids according to claim, wherein said amino acid is an amino acid salt of L- amino acids, D- amino acids or D, L- amino acids. 7.根据权利要求6所述含羟基的N-酰代氨基酸的制备方法，其特征是所述氨基酸为甘氨酸、色氨酸、蛋氨酸、苏氨酸、缬氨酸、赖氨酸、组氨酸、亮氨酸、异亮氨酸、丙氨酸、苯丙氨酸、胱氨酸、半胱氨酸、精氨酸、丝氨酸、酪氨酸、谷氨酸、天门冬氨酸或瓜氨酸。 7. The method of preparing the 6 N- Acyl hydroxyl-containing amino acids according to claim, wherein the amino acid is glycine, tryptophan, methionine, threonine, valine, lysine, histidine , leucine, isoleucine, alanine, phenylalanine, cystine, cysteine, arginine, serine, tyrosine, glutamic acid, aspartic acid or citrulline . 8.根据权利要求3、4或5所述含羟基的N-酰代氨基酸的制备方法，其特征是所述带保护基团的氨基酸盐为Ν( ε )-羰基苄氧基-L-赖氨酸盐、N ( ε )-羰基苄氧基-D-赖氨酸盐、 N ( O -羰基苄氧基-D，L-赖氨酸盐、N ( ε )-叔丁氧羰基-L-赖氨酸盐、N ( ε )-叔丁氧羰基-D-赖氨酸盐、Ν( ε )-叔丁氧羰基-D，L-赖氨酸盐、L-天门冬氨酸盐-β -苄酯、D-天门冬氨酸盐-β -苄酯、D，L-天门冬氨酸盐-β -苄酯、L-天门冬氨酸盐-β -金刚烷酯、D-天门冬氨酸盐-β -金刚烷酯、D，L-天门冬氨酸盐-β -金刚烷酯、L-天门冬氨酸盐-β -环烷酯、D-天门冬氨酸盐-β -环烷酯、D，L-天门冬氨酸盐-β -环烷酯、L-谷氨酸盐-Y -苄酯、D-谷氨酸盐-Y -苄酯、D，L-谷氨酸盐-Y -苄酯、L-谷氨酸盐-Y -金刚烷酯、D-谷氨酸盐-Y -金刚烷酯、D，L-谷氨酸盐-Y -金刚烷酯、L-谷氨酸盐-Y -环烷酯、D-谷氨酸盐-Y -环烷酯、D，L-谷氨酸 3, 4, 5 or 8. A method of preparing the N- Acyl hydroxyl-containing amino acids according to claim, characterized in that the salt of a protected amino group is Ν (ε) - benzyloxy carbonyl group -L- Lai acid salt, N (ε) - benzyloxy carbonyl group -D- lysine, N (O - benzyloxy carbonyl group -D, L- lysine, N (ε) - tert-butoxycarbonyl group -L - salts of lysine, N (ε) - tert-butoxycarbonyl group -D- lysine, Ν (ε) - tert-butoxycarbonyl group -D, L- lysine, L- aspartate - β - benzyl ester, D- aspartate -β - benzyl ester, D, L- aspartate -β - benzyl ester, L- aspartate -β - adamantyl, D- tianmen aspartic acid salt -β - adamantyl, D, L- aspartate -β - adamantyl, L- aspartate -β - cycloalkyl esters, D- [beta] -D-aspartate - cycloalkyl ester, D, L- aspartate [beta] -D - cycloalkyl ester, L- glutamate -Y - benzyl ester, D- glutamate -Y - benzyl ester, D, L- Valley acid salt -Y - benzyl ester, L- glutamate -Y - adamantyl, D- glutamate -Y - adamantyl, D, L- glutamate -Y - adamantyl acrylate, L- glutamate -Y - cycloalkyl esters, D- glutamate -Y - cycloalkyl ester, D, L- glutamic acid 盐-Y -环烷酯、0-苄基-L-丝氨酸盐、0-苄基-D-丝氨酸盐、 0-苄基-D，L-丝氨酸盐、0-叔丁基-L-丝氨酸盐、0-叔丁基-D-丝氨酸盐、0-叔丁基-D， L-丝氨酸盐、0- (2-苄氧草酰基)-L-丝氨酸盐、0- (2-苄氧草酰基)-D-丝氨酸盐、0- (2-苄氧草酰基)-D, L-丝氨酸盐、0- 丁二酰基-L-丝氨酸盐、0- 丁二酰基-D-丝氨酸盐、0- 丁二酰基-D，L-丝氨酸盐、0-苄基-L-酪氨酸盐、0-苄基-D-酪氨酸盐、0-苄基-D，L-酪氨酸盐、0-叔丁基-L-酪氨酸盐、0-叔丁基-D-酪氨酸盐、0-叔丁基-D，L-酪氨酸盐、0-苄基-L-苏氨酸盐、0-苄基-D-苏氨酸盐、0-苄基-D，L-苏氨酸盐、0-叔丁基-L-苏氨酸盐、 0-叔丁基-D-苏氨酸盐、0-叔丁基-D，L-苏氨酸盐、S-苄基-L-半胱氨酸盐、S-苄基-D-半胱氨酸盐、S-苄基-D，L-半胱氨酸盐、S-对甲苄基-L-半胱氨酸盐、S-对甲苄基-D-半胱氨酸盐、S-对甲苄基-D，L-半胱氨酸盐、S-对甲氧苄基-L-半胱氨酸 Salt -Y - cycloalkyl ester, salt of O-benzylhydroxylamine -L- serine, O-benzyl serine -D- salt, O-benzylhydroxylamine -D, L- serine salt, serine salt -L- tert-butyl-0- , O-t-butyl-serine salt -D-, O-tert-butyl -D, L- serine salt, O- (2-benzyloxy oxalyl) -L- serine salt, O- (2-benzyloxy oxalyl ) -D- salt-serine, O- (2-benzyloxy oxalyl) -D, L- serine salt, serine salt 0- succinyl -L-, -D-succinyl-serine salt 0-, 0- D diacyl -D, L- serine salts, salts of O-benzylhydroxylamine -L- tyrosine, O-benzyl-tyrosine -D- salt, O-benzylhydroxylamine -D, L- tyrosine salts, 0- salt -L- tyrosine tert-butyl, tert-butyl 0- salt -D- tyrosine, O-tert-butyl -D, L- tyrosine salts, O-benzyl-threonine salt -L- , O-benzyl-threonine -D- salt thereof, O-benzylhydroxylamine -D, L- threonine salt, t-butyl 0- salt -L- threonine, O-t-butyl-threonyl -D- acid, t-butyl 0- -D, L-threonine salt, S- benzyl -L- cysteine ​​salts, S- benzyl -D- cysteine ​​salts, S- benzyl -D , L- cysteine ​​salt, S- methylbenzyl -L- cysteine ​​of salt, S- methylbenzyl for cysteine ​​-D- salt, S- methylbenzyl of -D, L- salt cysteine, S- p-methoxybenzyl -L- cysteine 、S-对甲氧苄基-D-半胱氨酸盐、S-对甲氧苄基-D，L-半胱氨酸盐、S-叔丁基-L-半胱氨酸盐、S-叔丁基-D-半胱氨酸盐、S-叔丁基-D，L-半胱氨酸盐、S-三苯甲基-L-半胱氨酸盐、S-三苯甲基-D-半胱氨酸盐、S-三苯甲基-D，L-半胱氨酸盐、S-对硝基苄基-L-半胱氨酸盐、S-对硝基苄基-D-半胱氨酸盐或S-对硝基苄基-D，L-半胱氨酸盐。 , S- p-methoxybenzyl group -D- cysteine ​​salts, S- p-methoxybenzyl -D, L- cysteine ​​salt, S- -L- tert-butyl-cysteine ​​salt, S - tert-butyl -D- cysteine ​​salt, S- t-butyl -D, L- cysteine ​​salt, S- trityl salt -L- cysteine, S- trityl -D- cysteine ​​salts, S- trityl -D, L- cysteine ​​salt, S- p-nitrobenzyl salt -L- cysteine, S- p-nitrobenzyl - D- or S- cysteine ​​salt p-nitrobenzyl -D, L- cysteine ​​salts. 9.根据权利要求3、4或5所述含羟基的N-酰代氨基酸的制备方法，其特征是所述环内酯(IV)为£-己内酯、对二氧环己酮、1，3-丙内酯、1，4-丁内酯、1，5-戊内酯、1，7-庚内酯、1，4-庚内酯、Y-辛内酯、δ-辛内酯、γ-壬内酯、δ-壬内酯、γ-癸内酯、δ-癸内酯、ε -癸内酯、丁位十一内酯、丁位十二内酯、丁位十三内酯、丁位十四内酯、环十五内酯或环十六内酯。 3, 4, 5 or 9. A method of preparing the N- Acyl hydroxyl-containing amino acids according to claim, characterized in that the macrolide (IV) as £ - caprolactone, dioxanone, cyclohexanone, 1 3-propiolactone, butyrolactone, 1,4, 1,5-valerolactone, 1,7-lactone, 1,4-heptalactone, Y- caprolactone, delta-octanoic lactone , [gamma] -nonalactone, delta-nonalactone, [gamma] -decalactone, delta-decalactone, ε - decalactone, undecalactone bit butyl, butyl bit Dodecalactone, butylated bits in thirteen ester, fourteen bits butyl lactone, cyclopentadecanolide or cyclic hexadecanolide. Abele et al. 1999 Oligomers of β2‐and of β3‐Homoproline: What are the Secondary Structures of β‐Peptides Lacking H‐Bonds?